The video raises further questions about the actions of the officer, Scot Peterson, who was a Broward sheriff's deputy assigned as the lone armed officer protecting Marjory Stoneman Douglas High School. The Broward County Sheriff's Office released video footage Thursday that showed the armed school resource officer on campus during the Parkland, Florida, shooting rampage standing outside a school building while the massacre unfolded inside. The video raises further questions about the actions of the officer, Scot Peterson, who was a Broward sheriff's deputy assigned as the lone armed officer protecting Marjory Stoneman Douglas High School. Peterson's behavior during and after the gunfire have become the focus of intense scrutiny, with Broward County Sheriff Scott Israel assailing him for not rushing inside to confront the gunman. Peterson, who resigned after being suspended and is under investigation over his actions, has defended his response to the shooting by arguing that he believed the gunfire was coming from outside, rather than inside, a school building. Because of that, he said, he "took up a tactical position" to try to assess the situation. The video footage, along with audio dispatch records released last week, calls into question Peterson's statement and actions. The video captured him hurrying across the campus as the massacre was unfolding and then - while, police said, the shooting continued - standing outside for several minutes without seeming to take cover. An attorney for Peterson did not respond to a message seeking comment Thursday. In part of the footage released Thursday, Peterson is obscured by a pole, but other portions of the recording show him standing still. The video footage does not include sound, but the sheriff's office last week released dispatch recordings that captured some of what Peterson said during the massacre. These audio recordings show that Peterson quickly zeroed in on the building where the massacre occurred - something backed up by the video, which shows him arriving at the structure two minutes after the gunfire began - and then seemingly focusing on the building in what he reported over the radio. "We're talking about the 1200 building," Peterson said at one point, according to the audio recordings. When another officer later said some students had reported possible firecrackers by the football field, Peterson replied: "We also heard it's by, inside the 1200 building." Around the same time, the video recording showed him remaining outside that building. "The video speaks for itself," the sheriff's office said in a statement. "His actions were enough to warrant an internal affairs investigation, as requested by Sheriff Scott Israel on Feb. 21. After being suspended without pay, Peterson chose to resign and immediately retired rather than face possible termination." The statement added that the sheriff's office was unable to discuss more about the investigation because of Florida law. 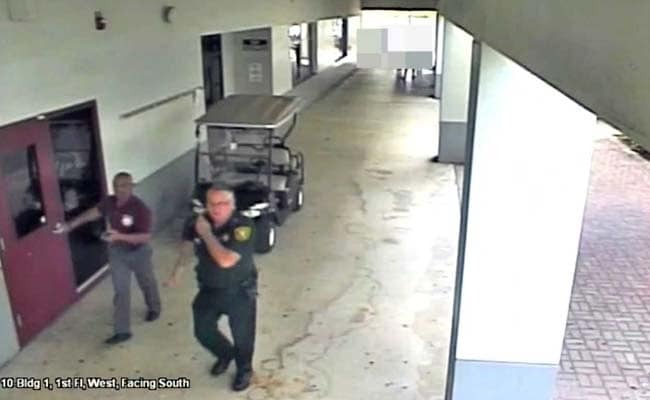 The sheriff's office released the 27-minute video clip, most of which comes from a stationary camera on the Stoneman Douglas campus, after being ordered to do so by a judge. Its release comes as the sheriff's office has faced intense scrutiny for its response to the Feb. 14 shooting as well as how its deputies acted before and after the massacre. The Broward Sheriff's Office is investigating allegations that multiple other deputies responded to the school but remained outside, while the Florida Department of Law Enforcement is reviewing the police response to the shooting. A state panel approved by lawmakers is also going to review the law enforcement response to the shooting and prior contacts that officials had with the suspected gunman, who had repeatedly come to the attention of police and the FBI before the massacre. The week after the shooting, Israel assailed Peterson for his response, describing the video recording as showing the deputy heading to the building, taking up a position outside and then failing to rush in to confront the gunman, breaking with generally accepted police practice. Israel said that after being suspended, Peterson opted to resign, filing his retirement paperwork that day. Peterson, through an attorney, pushed back at Israel's depictions of his actions, though he has not commented publicly since. After Israel publicly described the video footage of Peterson, media outlets filed a lawsuit seeking to have county officials release the clips. Authorities sought to argue that releasing the videos would hurt the ongoing investigation, while school officials said releasing the footage could reveal vulnerabilities in the security system. The sheriff's office, meanwhile, ultimately reversed course and said it supported making the footage public. Broward County Circuit Judge Jeffrey Levenson, in an eight-page order released Monday, said the videos could be released without imperiling the school's security system or endangering the investigation into the massacre. Levenson ordered the sheriff's office to release a version of the video with "the identities of the students and unknown witnesses" removed between noon Thursday and noon Friday.